Have you ever thought about going vegan before? Here is the perfect opportunity to give it a try! Try it for a week, a month, a year or sign up for this 21 day vegan resolution challenge put on by one of my teachers at Integrative Nutrition, Dr. Neal Barnard, MD. This program will supply you with recipes, daily email support and an eating out guide. It’s starts this week. I looked through the recipes and there are some that contain wheat, so I will be making some easy adjustments and can certainly help anyone who is wheat-free with substitutes. This will also work as a great gentle detox start to the year. 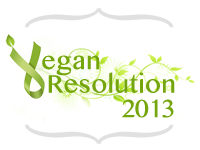 Vegan diets, eliminate many of the foods we are allergic to or may have sensitivities to, including dairy and eggs. If you also eliminate the wheat and sugars, you will gently detox your system without feeling like you are giving anything up. You may even find you like not eating as much meat or dairy, as you do and change you habits. Also, if you do want to reintroduce some of these allergens back into your diet I can support you through an elimination diet. I have been working with several people who are in the process of eliminating foods from their diets and they are telling me all the time how much better they are feeling, physically and emotionally, when they have removed certain foods from their diet. I am especially hearing from women who are dealing with PMS and menopausal changes. I am going to take the 21 day challenge and will blog and share on my Facebook page how it is going. I was just saying to my husband that I would like us to eat less meat and with the help of the recipes, shopping ideas and support, this will make it easy. Even when we are in our camper 10 miles up a dirt road! I’m excited, are you! ← Nutrition and how food affects us vibrationally!